Nice Dark Souls bonfire, Just Cause 3. And players can light it, too. You can find it on the small island of Cauda and it isn’t the only hidden easter egg out there. Medici is huge, there’s plenty more. For example, Mr. Snowman from Just Cause 2 is back (Rico even says “So we meet again, Mister Snowman”). OniZombie’s video shows where the snowman is. This time it’s not a Ski Resort. A downhill challenge with a stupid soapbox car? Sounds good! Stefano SPGamer’s video shows its exact location. You can find Thor’s Hammer in a remote mountain location (check the vid for the coordinates). Might need a chopper to reach it though. Sadly it’s not usable, Rico is already strong enough. One of the lakes in the game has a giant ridable rubber duck. OniZombie has a video to show which lake is it. Remember the Mile High Club airship from the previous game? 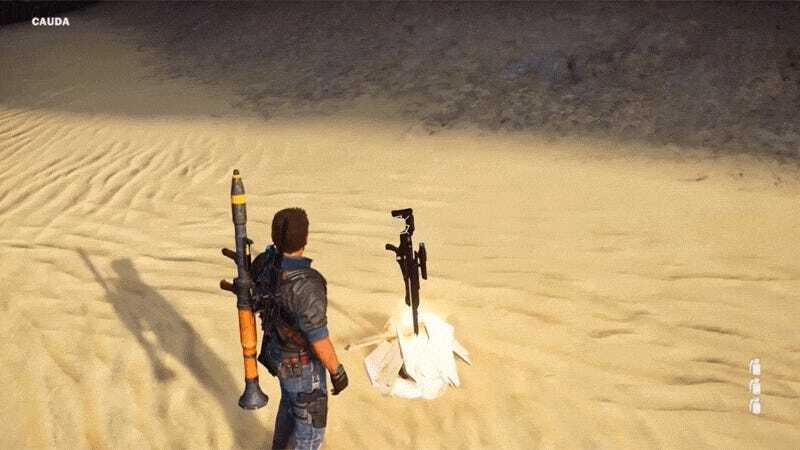 It can be found in Just Cause 3 too, although it... changed a bit. The Stargate from the classic TV show? There’s a working version of it that can teleport us to another part of the map. And it also has the same flashy effects as the original one.